Please find below an extract from a project I am working on (on and off) when I find time at home. The commentary of Shaykh Muhammad Hayat al-Sindi who migrated to Madina the Illuminated is a nice medium sized work which I had been seeking for some time. Last June during a trip to the Haramain I made dua that I find this book in one of the Islamic bookshops located in proximity of the two sacred mosques. Having had little success in the bookshops in Makkah (not helped by the ever changing Makkan landscape) I tried the Maktabah Dar al-Zaman in Madinah al-Munawwarah. Climbing up the stairs I eagerly questioned the gentleman behind the counter about this commentary, his reply -without bothering to check on his catalogue- was that they did not stock the work. Having received my answer I began to scan the shelves for any other interesting items, and was overjoyed when I found this work placed on the booskhelf with the cover pointing outwards enabling it to be spotted from a distance. The commander of the believers, Abu Hafsah Umar bin al-Khattab (Allah be pleased with him) bin Nufayl Ibn Abd al-Uzza al-Adawi al-Qurashi. His lineage joins that of the Prophet (Allah bless him and give him peace) at Kab bin Lauay. His Kunyah was Abu Hafs, his laqab being al-Faruq due to his differentiating between truth and falsehood through his embracing of Islam. This is because the matter of the Muslims before him was of the utmost secrecy and after him was openly manifest. He embraced Islam after 40 men and 11 women in the sixth year of Prophethood. He was given allegiance for khilafah on the day al-Siddiq passed away (Allah be pleased with him), Tuesday 8th of Jamadi al-Ula in the 13th year of Hijrah. He died as a martyr in Madinah on Wednesday 4th of Dhul Hijjah in the 23 year of Hijrah aged 63 according to the most correct opinion. He said- being unique in narrating this hadith-: I heard the Messenger of Allah (Allah bless him and give him peace) saying: “Actions are only by intentions, meaning there is no consideration given to actions which may be those that carry reward with Allah (Most High) except by means of intentions. Thus those matters which are necessary and which are done for Allah (Most High) are accepted. If performed for other than Him they will be rejected, with perhaps the person deserving punishment. 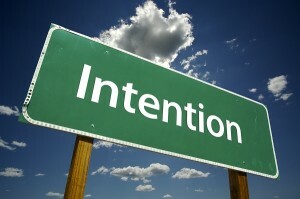 If the action is free of an intention then it is an action of no consequence. The lawful (mubah) matters by means of which one is able to reach good if done to reach evil will be a curse upon its perpetrators, and if free of an intention will be of no consequence. The unlawful if left for Allah will be good actions and if left for other than him they will be….. If they are done for Allah a grave sin is feared for the perpetrator so each man will have what he intended. Not that which others intended because the action of every person is reliant upon their intention and not the intention of others. Therefore if you have understood what has been mentioned know that Thus, he whose migration (hijrah) leaving the abode of disbelief and disobedience to head towards was to the place of the pleasure of Allah and His Messenger, his migration is to Allah and His Messenger;not to other than it, and he is praised for this in the beginning and end and is rewarded a good reward for it but he whose migration was for some worldly thing he might gain, meaning intending to attain it, whether he does or not or his migration was for a women he might marry, whether he wishes to marry her or not. Marriage to a woman was mentioned specifically along with it being part of the world (dunya) because it is from the greatest of its matters and objectives. This is from the specification after a generalisation.his migration is to that for which he migrated.” from the dunya and the woman, not to Allah and His messenger. Such a person is blamed for this and is not rewarded. This hadith is a great principle from the principles of the religion. It is incumbent for every servant to intend the pleasure of Allah (Most High) in his actions avoiding all that which is other than Him. For the sincere one is successful and the show off is at loss. Sincerity does not come from one except who knows the greatness of Allah (Most High) and His watching over His creation.